An accessible introduction to the phonetic analysis of speech corpora, this workbook-style text provides an extensive set of exercises to help readers develop the necessary skills to design and carry out experiments in speech research. Companion website at www.wiley.com/go/harrington, which includes illustrations, video tutorials, appendices, and downloadable speech corpora for testing purposes. Jonathan Harrington is Professor of the Institute of Phonetics and Speech Processing (IPS), University of Munich, Germany. His recent research has primarily focused on modelling the acoustic and perceptual mechanisms of sound change. He is co-editor of Speech Production: Models, Phonetic Processes, and Techniques (with Marija Tabain, 2006) and Techniques in Speech Acoustics (with Steve Cassidy, 1999). Relationship between Machine Readable (MRPA) and International Phonetic Alphabet (IPA) for Australian English. Relationship between Machine Readable (MRPA) and International Phonetic Alphabet (IPA) for German. Downloadable Speech Databases Used in this Book. 1. Using Speech Corpora in Phonetics Research. 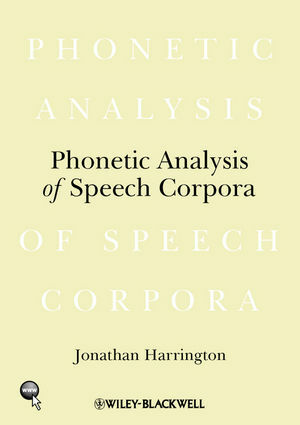 1.1 The Place of Corpora in the Phonetic Analysis of Speech. 1.2 Existing Speech Corpora for Phonetic Analysis. 1.3 Designing Your Own Corpus. 1.4 Summary and Structure of the Book. 2. Some Tools for Building and Querying Annotated Speech Databases. 2.2 Getting Started with Existing Speech Databases. 2.3 Interface between Praat and Emu. 2.5 Creating a New Speech Database: From Praat to Emu to R.
2.6 A First Look at the Template File. 3. Applying Routines for Speech Signal Processing. 3.2 Calculating, Displaying, and Correcting Formants. 3.3 Reading the Formants into R.
4.1 The Emu Query Tool, Segment Tiers, and Event Tiers. 4.2 Extending the Range of Queries: Annotations from the Same Tier. 4.3 Inter-tier Links and Queries. 4.4 Entering Structured Annotations with Emu. 4.5 Conversion of a Structured Annotation to a Praat TextGrid. 4.6 Graphical User Interface to the Emu Query Language. 4.8 Building Annotation Structures Semi-automatically with Emu-Tcl. 5. An Introduction to Speech Data Analysis in R: A Study of an EMA Database. 5.1 EMA Recordings and the ema5 Database. 5.2 Handling Segment Lists and Vectors in Emu-R.
5.3 An Analysis of Voice-Onset Time. 5.4 Intergestural Coordination and Ensemble Plots. 6. Analysis of Formants and Formant Transitions. 6.1 Vowel Ellipses in the F2ÍF1 Plane. 6.6 Vowel Undershoot and Formant Smoothing. 6.7 F2 Locus, Place of Articulation, and Variability. 7.2 An Overview of Electropalatography in Emu-R.
7.4 Analysis of EPG Data. 8.1 Background to Spectral Analysis. 8.2 Spectral Average, Sum, Ratio, Difference, Slope. 8.4 The Discrete Cosine Transformation. 9.1 Probability and Bayes’ Theorem. 9.5 Two Parameters: The Bivariate Normal Distribution and Ellipses. 9.6 Classification in Two Dimensions. 9.7 Classifications in Higher Dimensional Spaces.